Ah, organic! What’s not to love? No pesticides, chemical fertilizers or genetically modified organisms or additives. Just sunshine, fresh air and good, healthy soil. From the lush River Deltas of Northern California's Sacramento Valley comes this distinctive organic fruit and cheese gift basket that’s truly like no other. 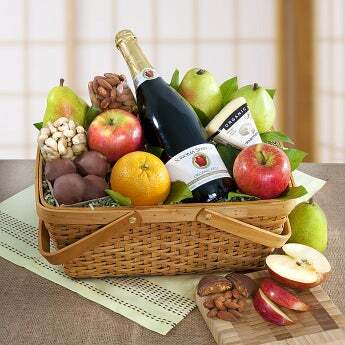 They’ll love the Organic Sonoma Apple Cider, Organic Almonds, Organic D’Anjou Pears, Organic Fuji Apples, Organic Navel Oranges, Organic Handmade Jack Cheese, Organic Chocolate Caramel Pecans and more. It’s easy to share – if they dare! The sturdy handles make this basket a perfect bicycle basket! Just secure the basket to handlebars!